We are a leading Manufacturer of freight elevators from Ghaziabad, India. 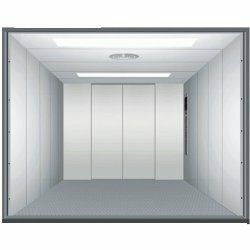 We are offering Freight Elevators that are widely used in moving bulk goods in the areas like factories, shops, showroom, factory, warehouse, department store or shipping center. These are specifically designed by our experienced designers to offer smooth riding experience and consuming less power. Our elevators also prohibit from carrying any passengers other than those required to handle the freight.